There's a certain time of year when people throw away their inhibitions and let loose with their innermost desires to act as whom they really want to be for just one day. It's a day where Las Vegas' slogan, "What happens in Vegas stays in Vegas" spreads its appealing ideals to all of the United States, creating a "Sin Nation." On this day, it's not only encouraged but required to take candy from strangers, and the corpses from mass mutilations of millions of defenseless pumpkins can be seen upon every doorstep. When next All Hallow's Eve comes rolling around the calendar, what will you be? Might I suggest showing off your love for motorcycles by wearing this awesome "Daredevil" costume? I know what you're thinking. 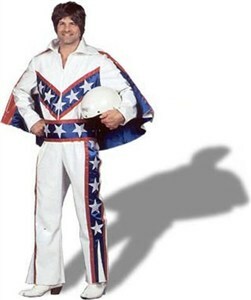 "If I wear this Evel Knievel costume, will I be granted all of the fearlessness and stunt-doing ability of the late, great Evel himself?" To which I will only reply: yes. This get-up is made by Peter Alan Inc. (makers of other fine costumes) and comes complete with a white jumpsuit accented in red and blue stripes with white stars, a matching cape, and a belt. You'll need to use your own helmet and white leather boots, but hey, those are easy to find anywhere. This will be one of those costumes you can wear year after year and still impress others.